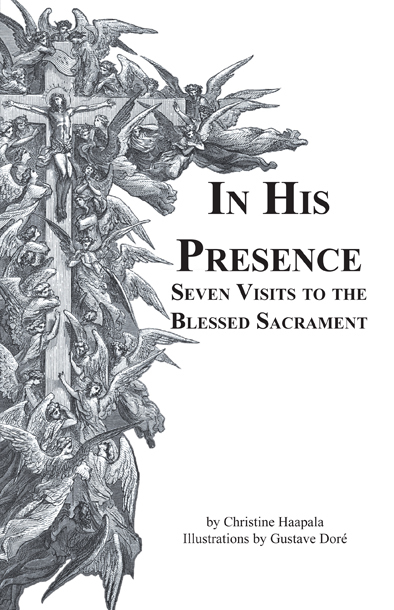 In His Presence Seven Visits to the Blessed Sacrament Order Kindle. This meditation book outlines SEVEN VISITS to the Blessed Sacrament. This prayer book can be used in one evening, such as, during the Holy Thursday Seven Church Pilgrimage. Download this Seven Church Visits Information in PDF format. This prayer book can alternatively be used for seven consecutive days for a special prayer request. And, it can be used periodically, whenever you can spend time visiting Jesus in the Blessed Sacrament. 64 pages. 21 Gustave Dore Illustrations from Dante's Divine Comedy. Quantity discounts of 40 or 60% available. Kindle Version. For information about the Kindle Lending Library or to purchase In His Presence in Kindle Format, Order Kindle Now.